Treatments for your doors can prove to be quite daunting, but woven shades can provide an easy solution to the problem. Natural woven shades create a relaxed atmosphere in your home and can convey a tranquil and natural atmosphere. The casual feel that this textured shade will create is soothing and is available in a wide array of hand woven styles and colors. 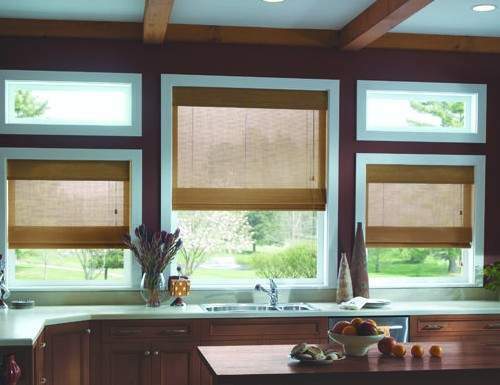 Woven shades are also available with privacy liner or blackout liner to provide increased protection and privacy. The liner is usually stitched to the back of the shade to protect the facing fabric from the sun. It can also be color coordinated to match the facing fabric. If your space has multiple doors, the shades will not only let in the sun but also keep the heat out and preserve some visibility depending on the liner and thickness of fabric chosen. These shades have an exotic but organic effect to any space they are used in. There are a few natural materials that are also used for some kinds of woven shades, like reeds, grasses, planks and bamboos. Depending on whether they are open knit or tightly woven together, they will let in more or less light. These natural materials are woven together using man-made materials like rope and twine into various patterns. Some styles use only one of those material while some others use a combination of these. Many of these are also available in a top down bottom up option, which means that it allows you to lower the shade from the top, raise it from the bottom as well as both at the same time. This provides good privacy and light control features. The woven wooden shades with blackout liners are generally recommended as the perfect choice for bedrooms or home theaters.